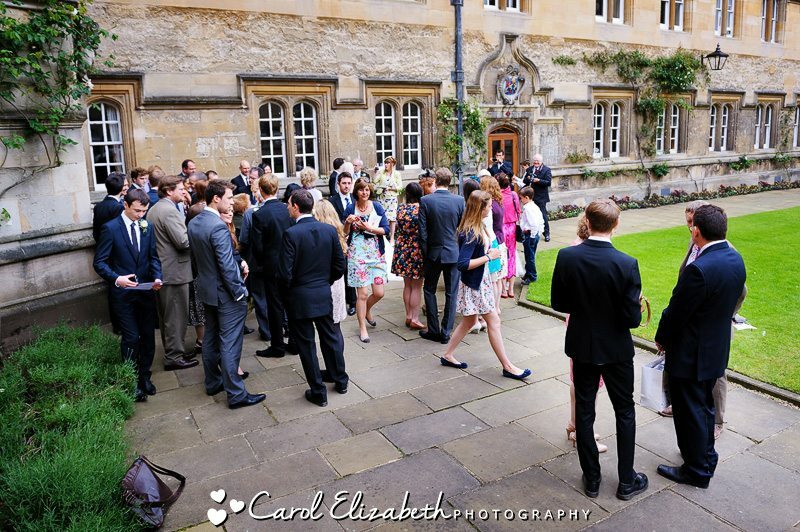 I get really excited about Oxford College weddings, and I feel especially privileged to photograph at one of the beautiful Colleges. 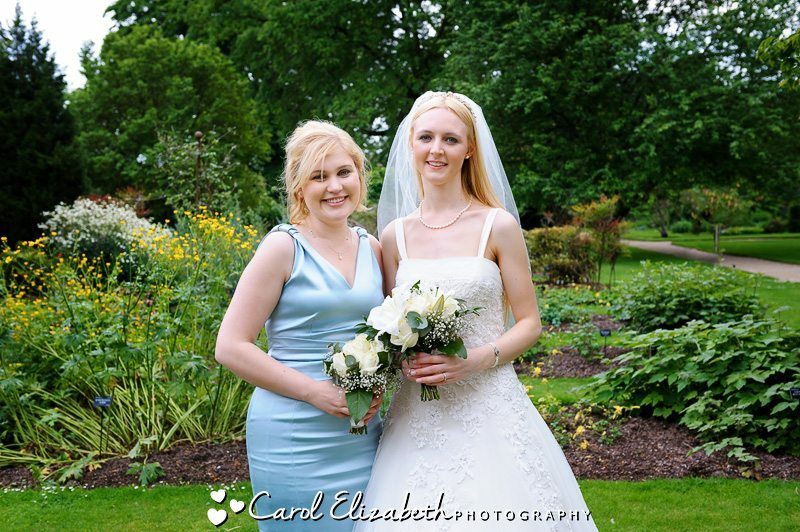 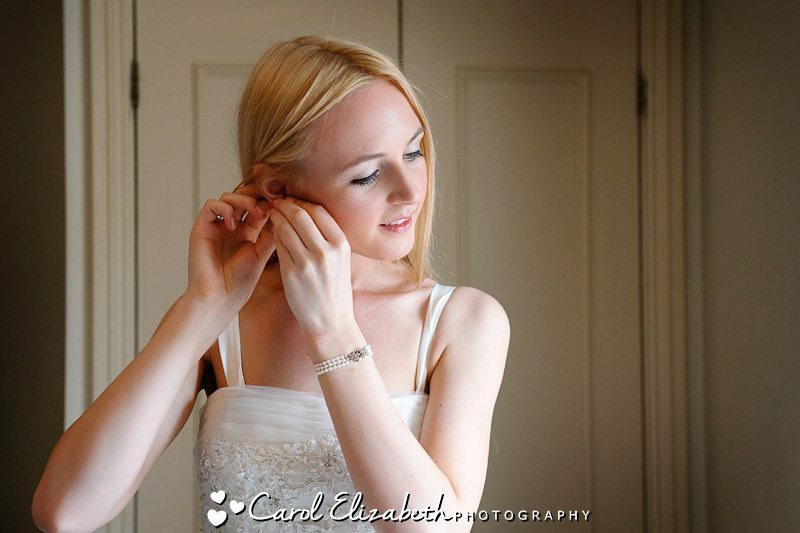 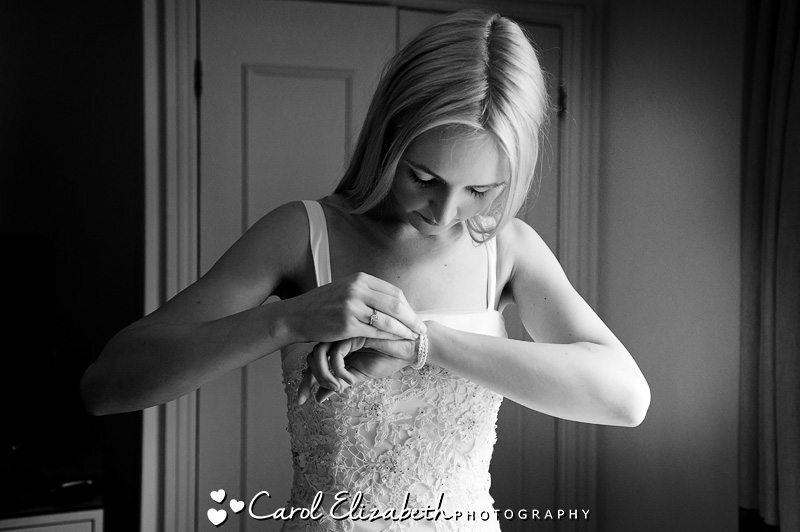 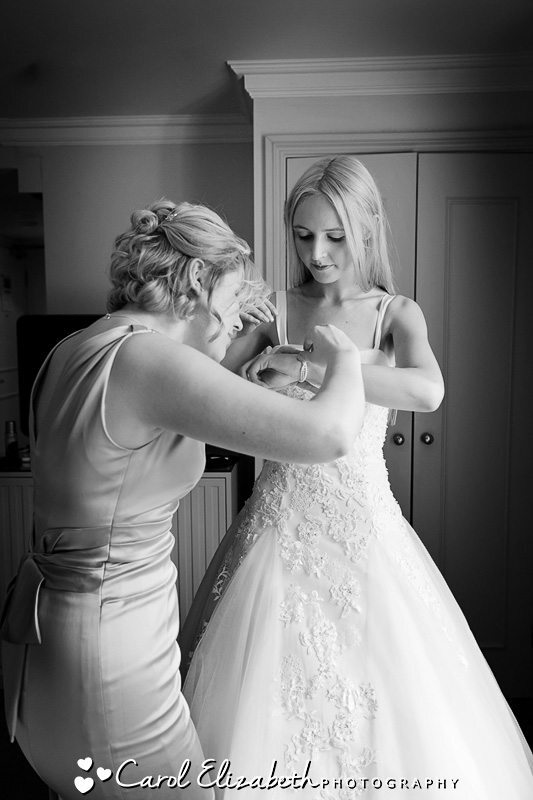 My day started with Bethan and her family for some last-minute bridal preparations. 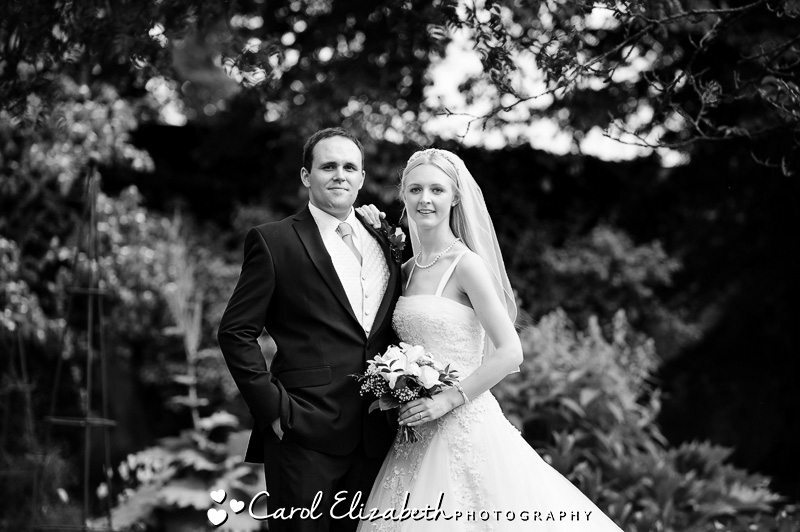 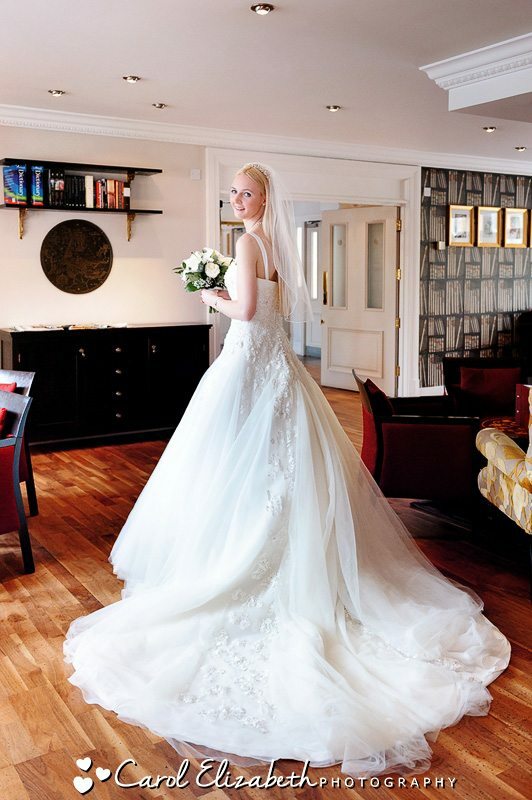 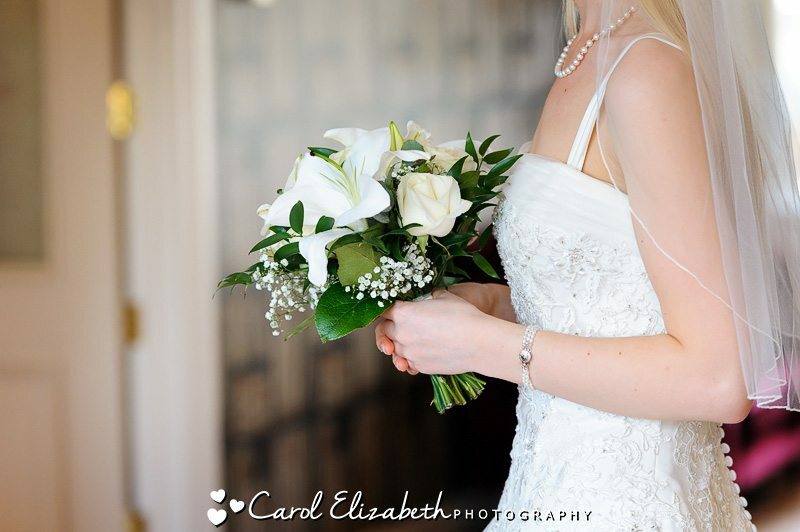 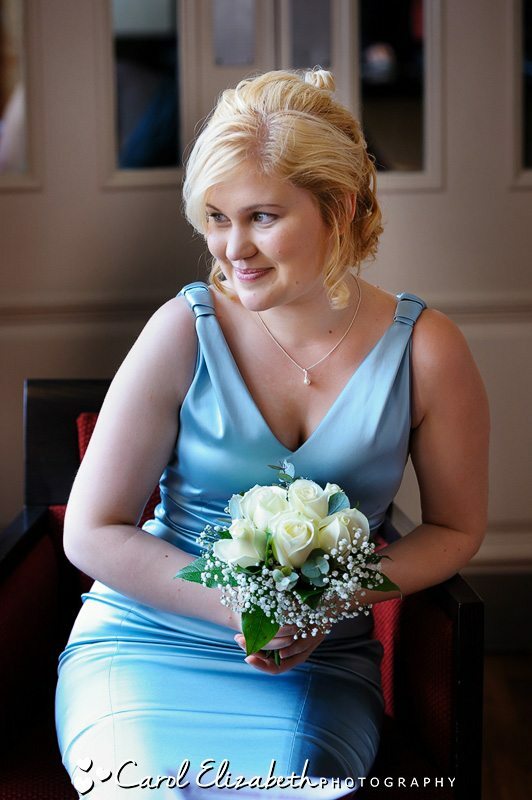 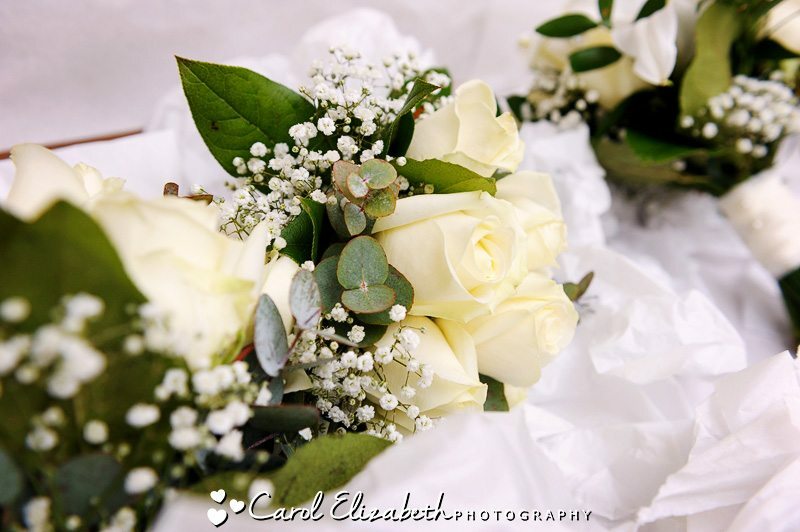 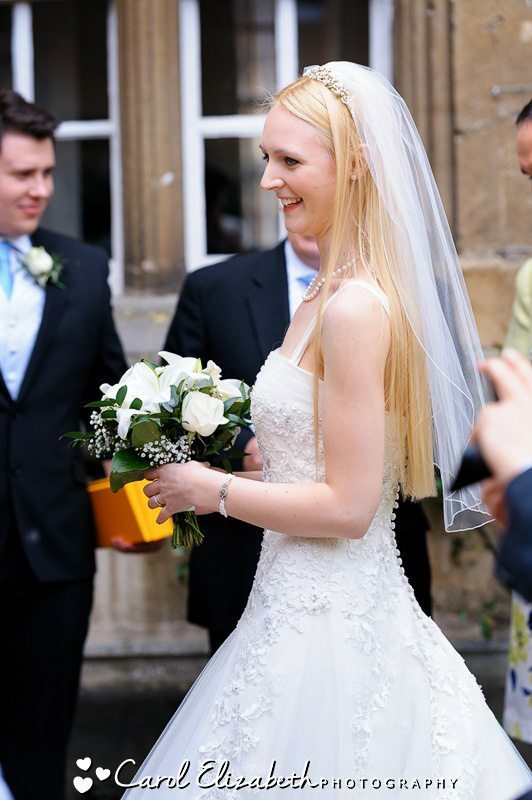 Bethan looked truly stunning in her wedding dress, with her blonde hair hanging loose and beautiful cream roses in her bouquet. 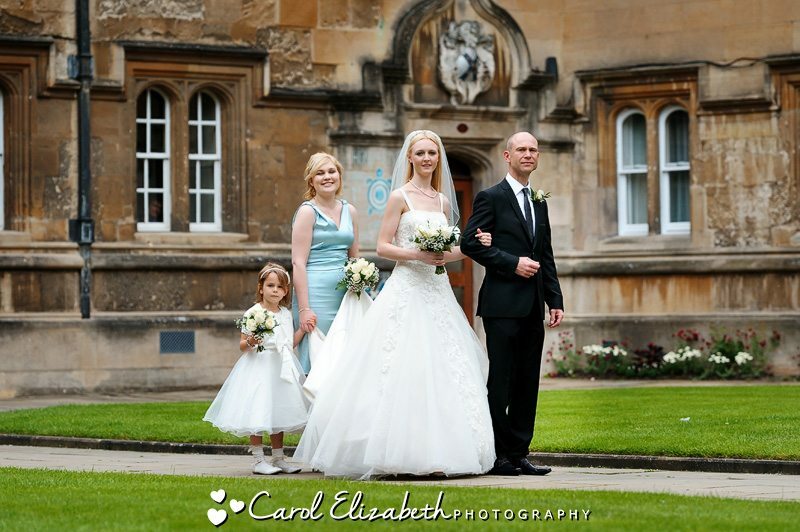 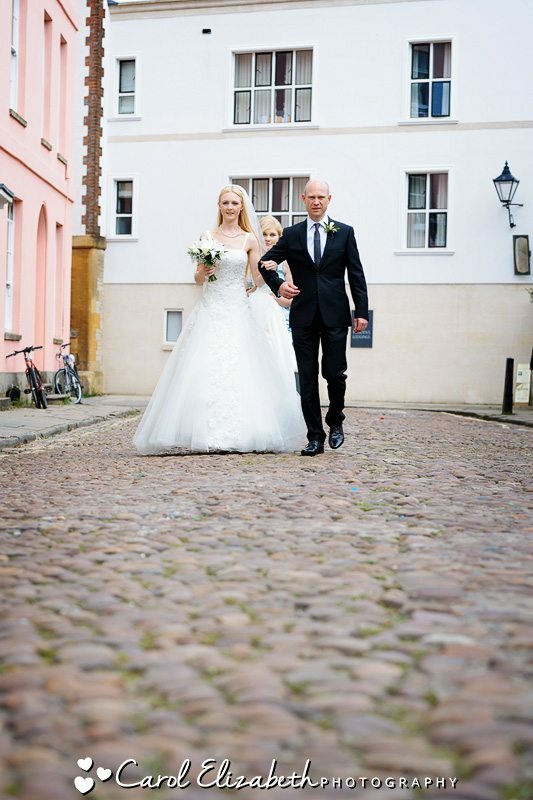 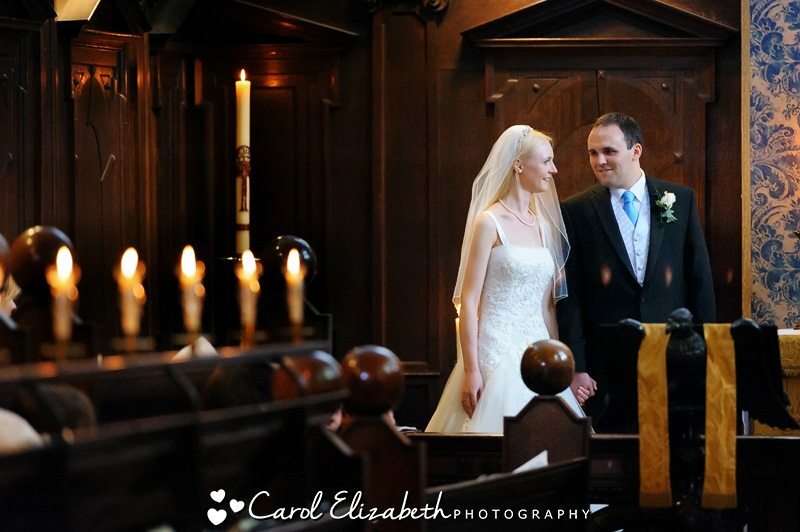 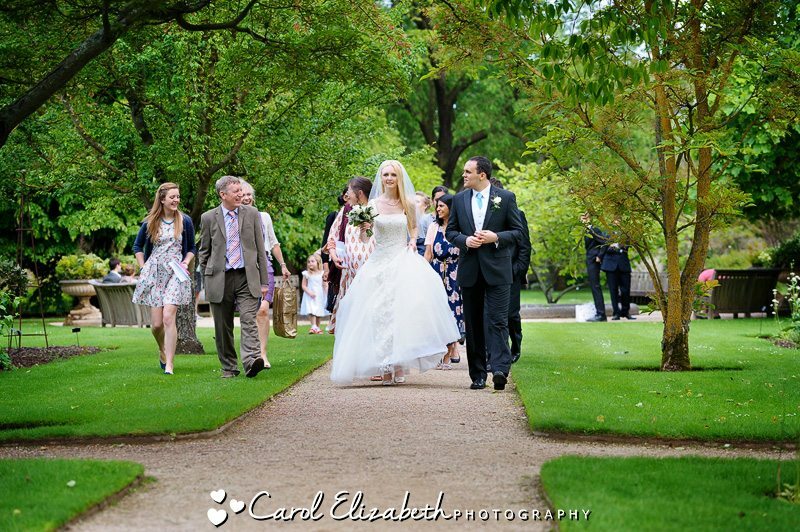 After a few portraits in the natural light of the hotel lounge we took the short walk over to the Oriel College wedding ceremony. 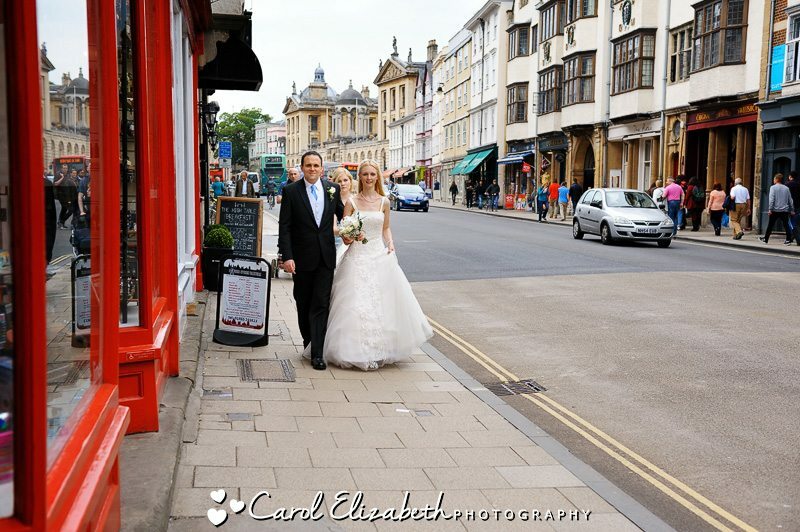 There are plenty of lovely old buildings which made a lovely backdrop for our walk. 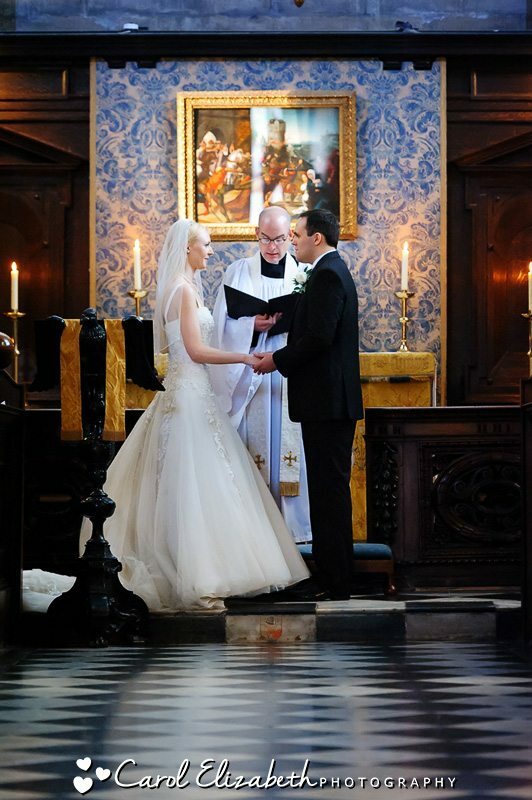 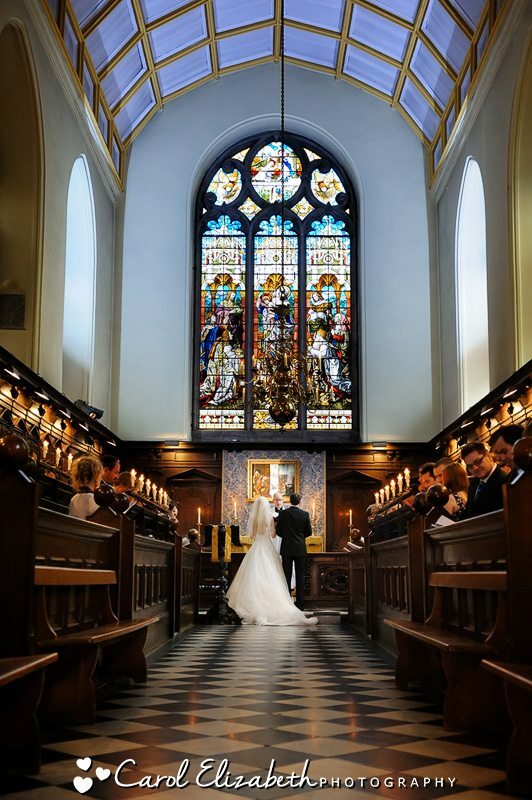 Linford was waiting at the alter for his beautiful bride, and the spectacular stained glass window made for some gorgeous wedding ceremony images. 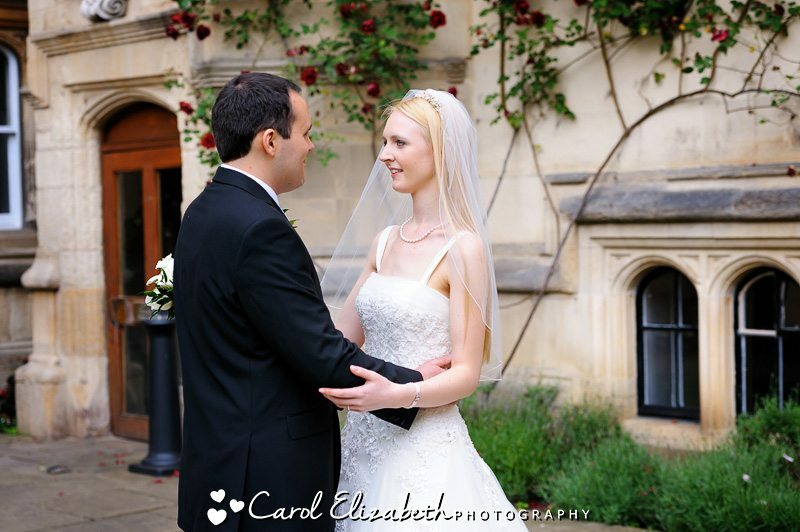 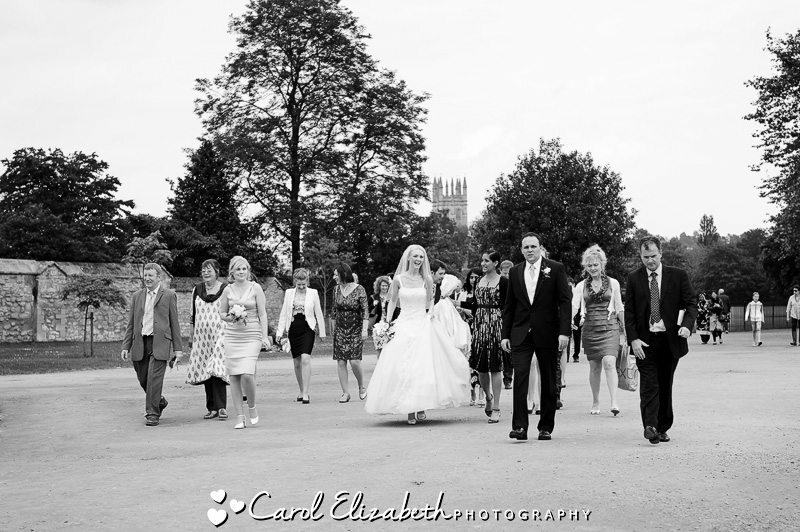 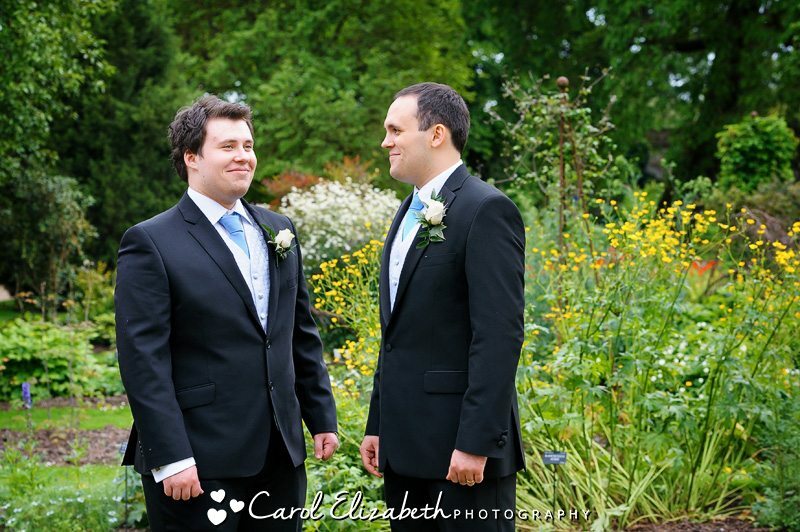 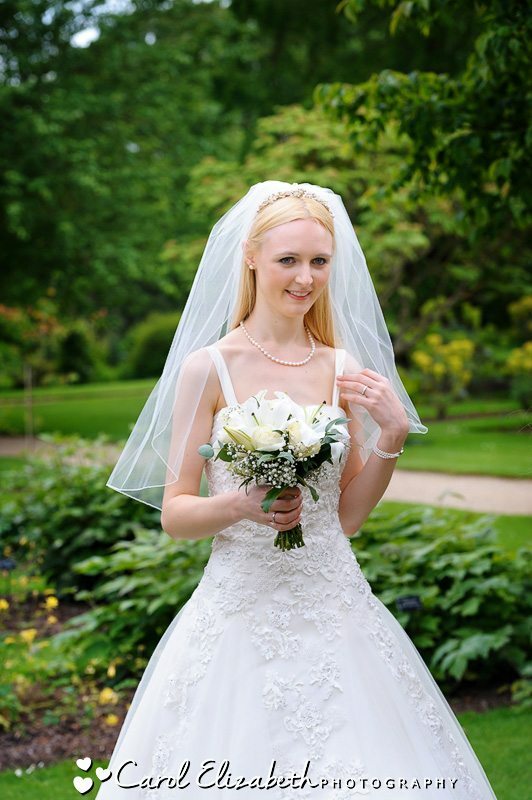 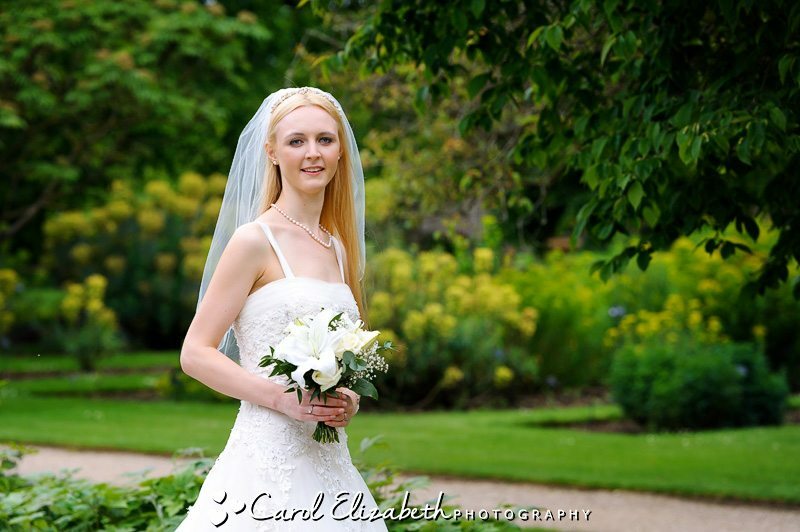 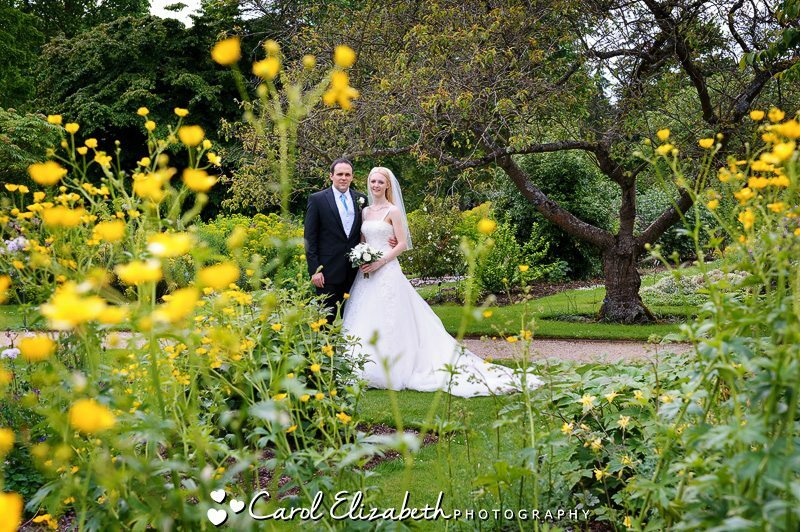 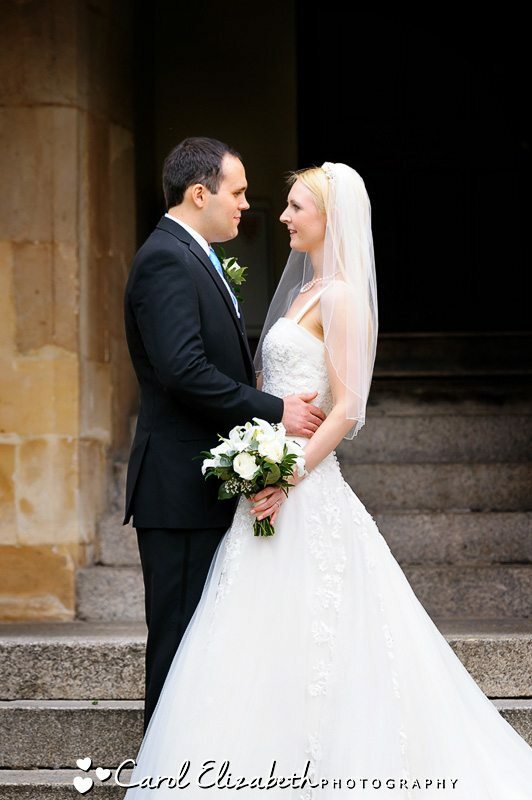 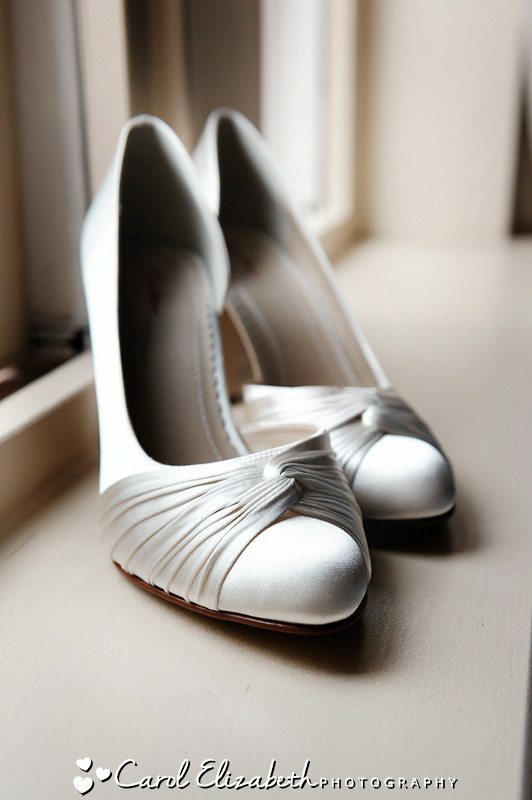 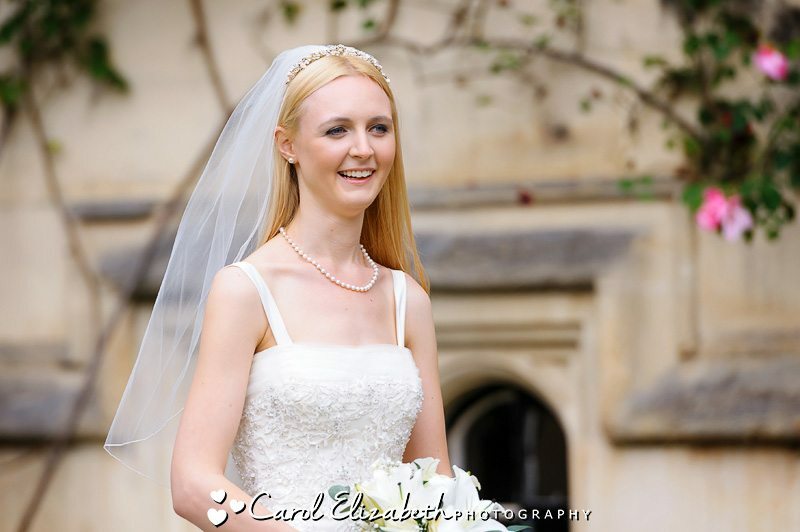 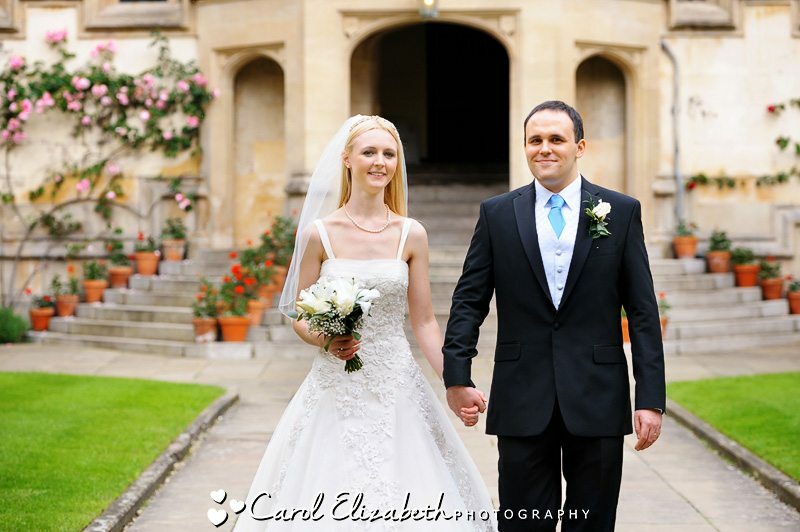 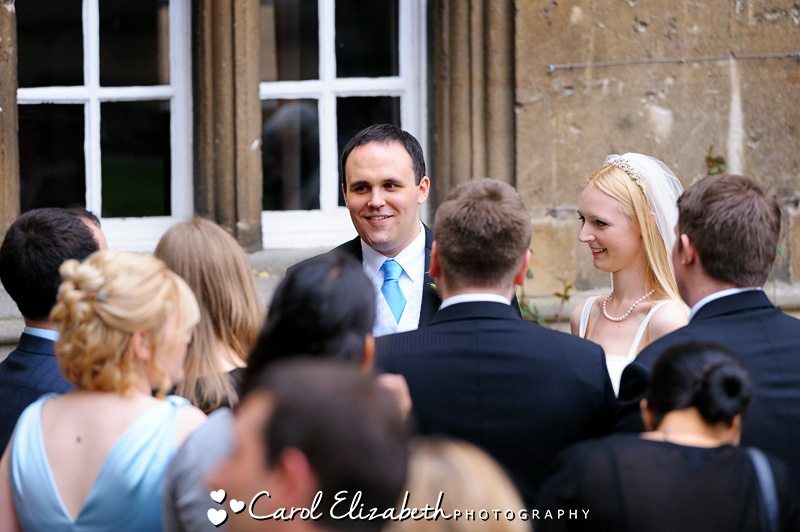 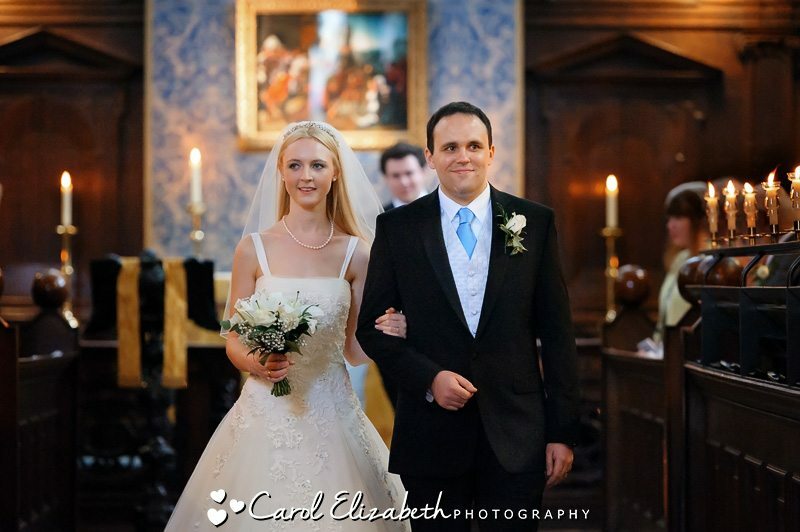 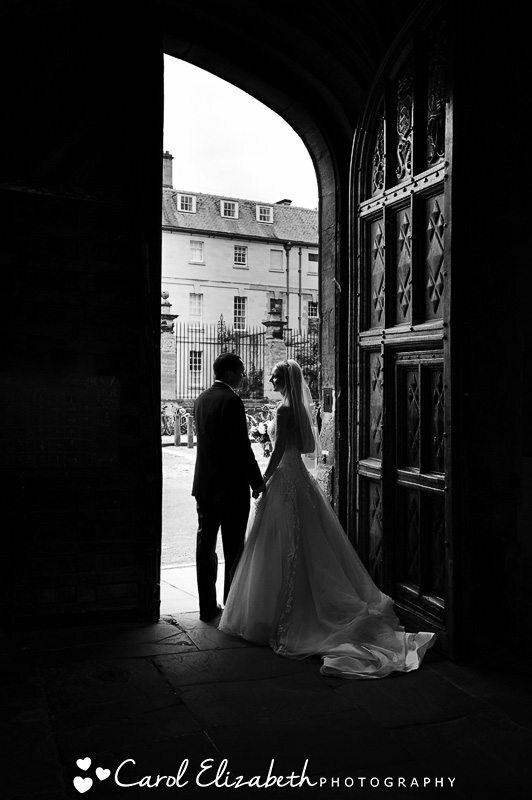 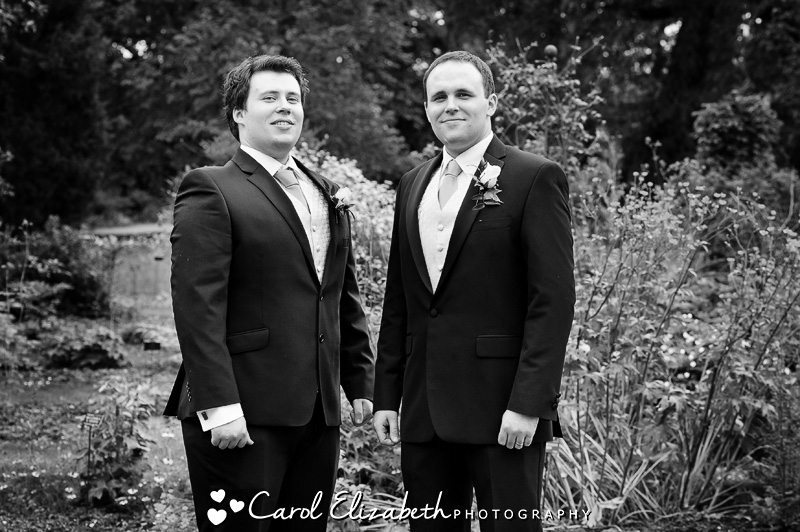 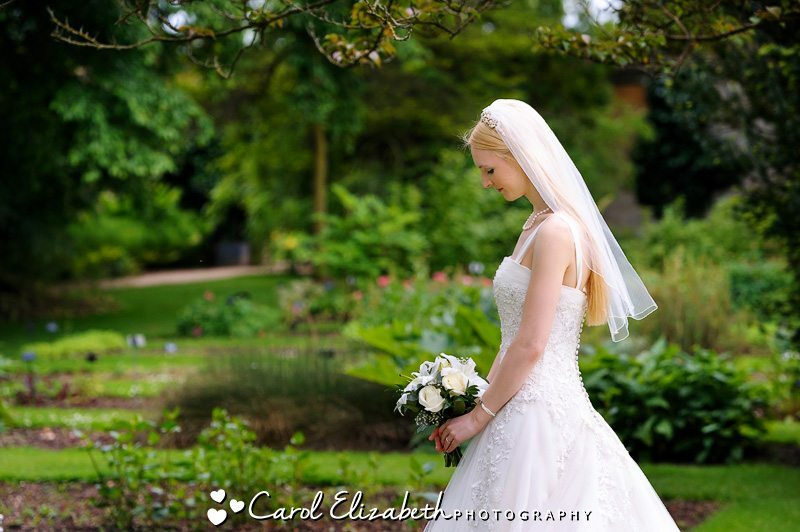 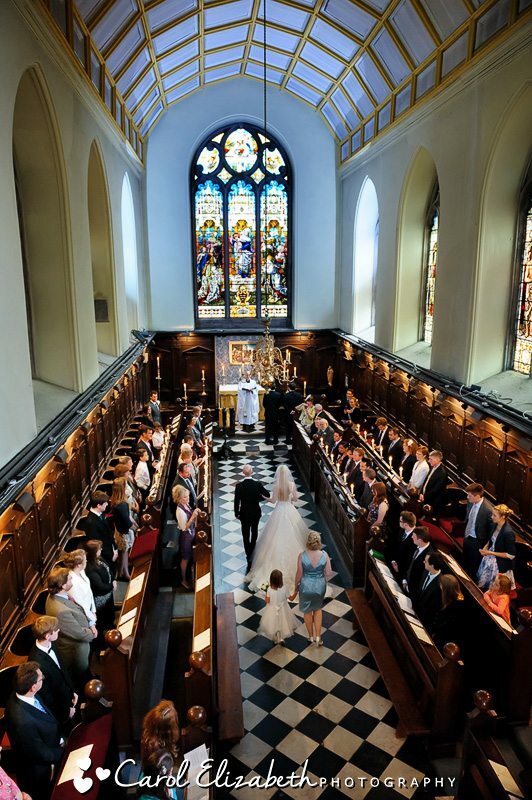 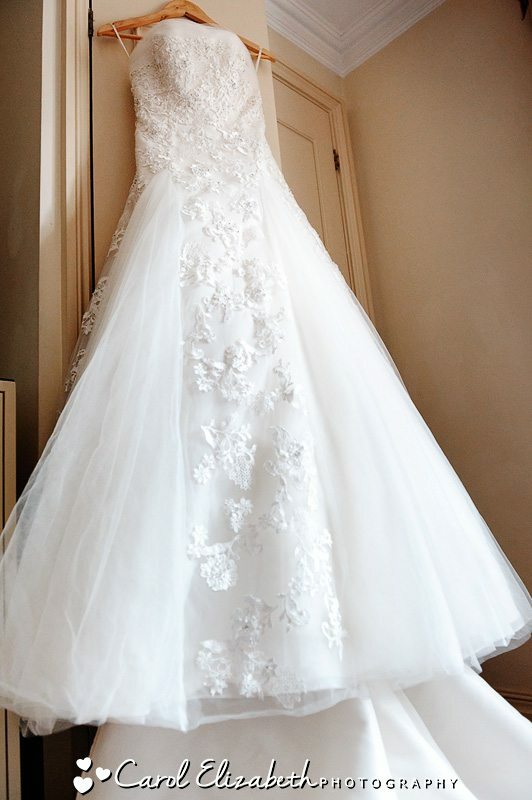 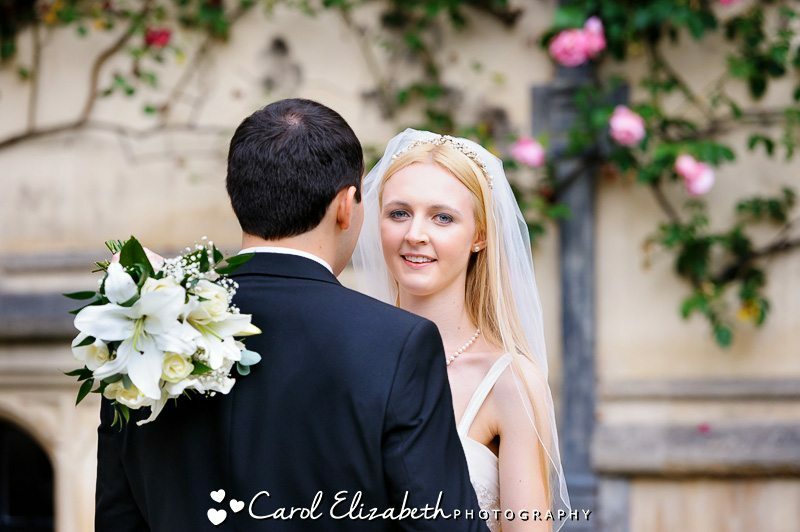 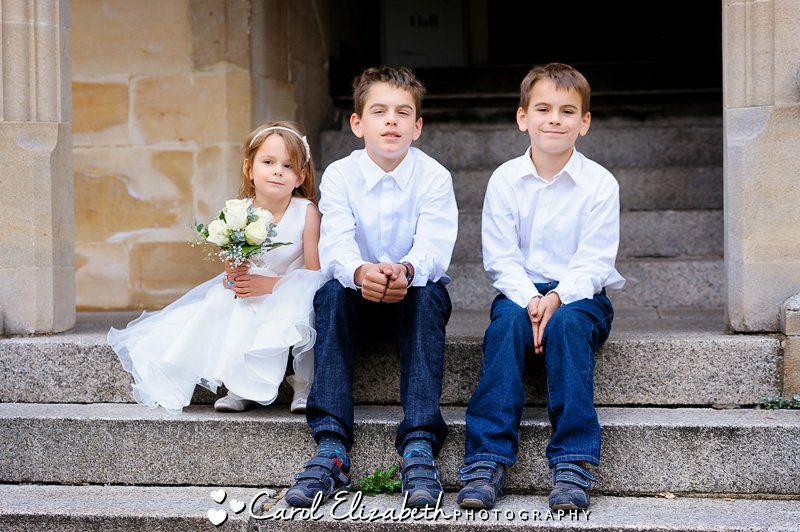 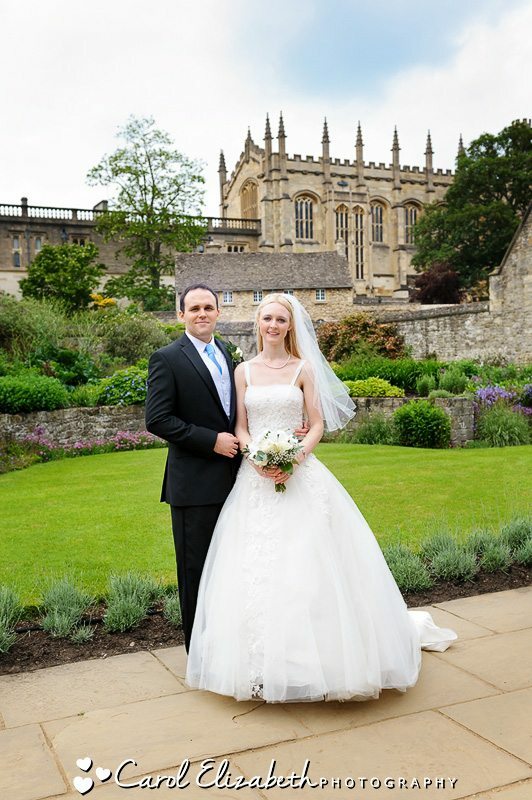 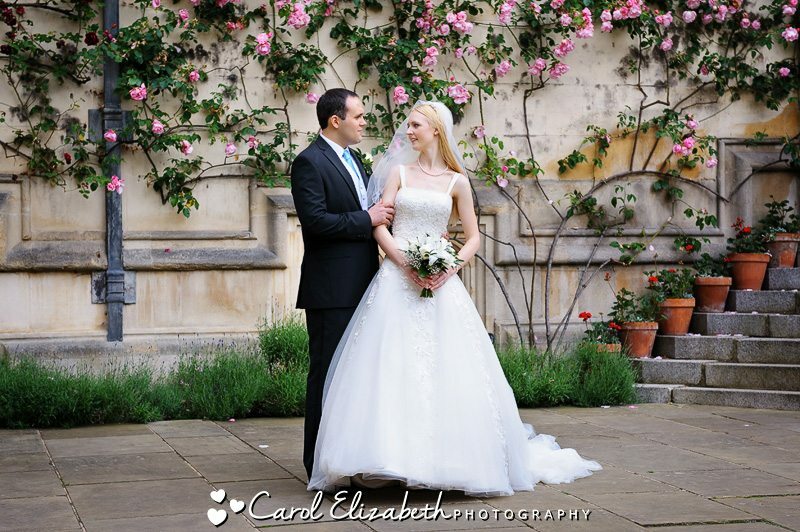 If you are able to have an Oxford University wedding ceremony at one of the beautiful colleges in Oxford then please get in touch if you would like to discuss your photography, as I specialise in delivering beautiful and timeless wedding photography which captures the essence of these very grand locations. 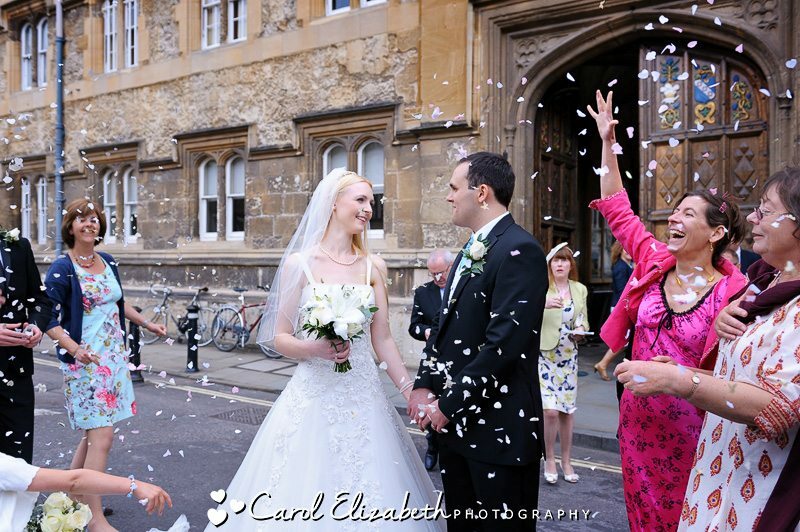 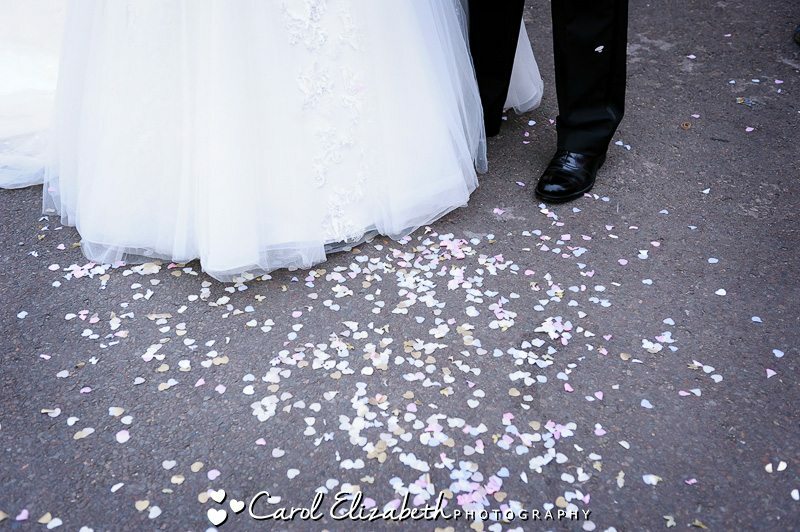 After the ceremony it was time for a few drinks and canapes followed by wedding confetti outside Oriel College’s large entrance doors. 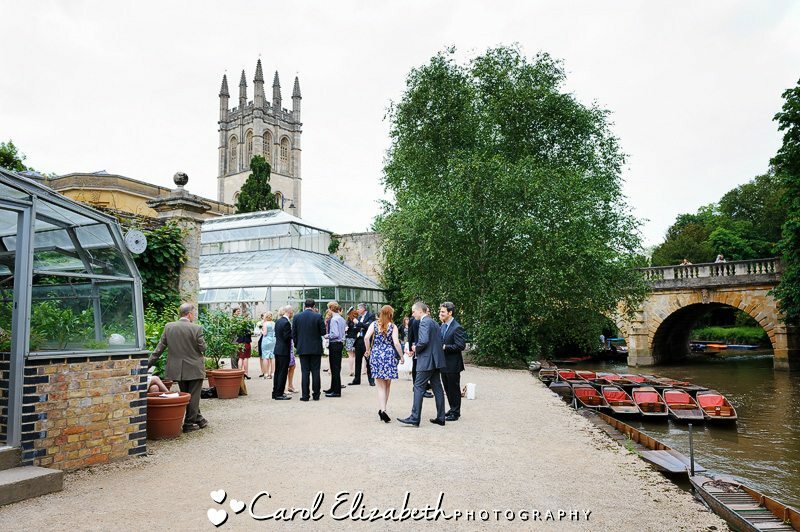 Then we headed off for another short walk, this time to Oxford Botanical Gardens for the wedding drinks and some group photographs. 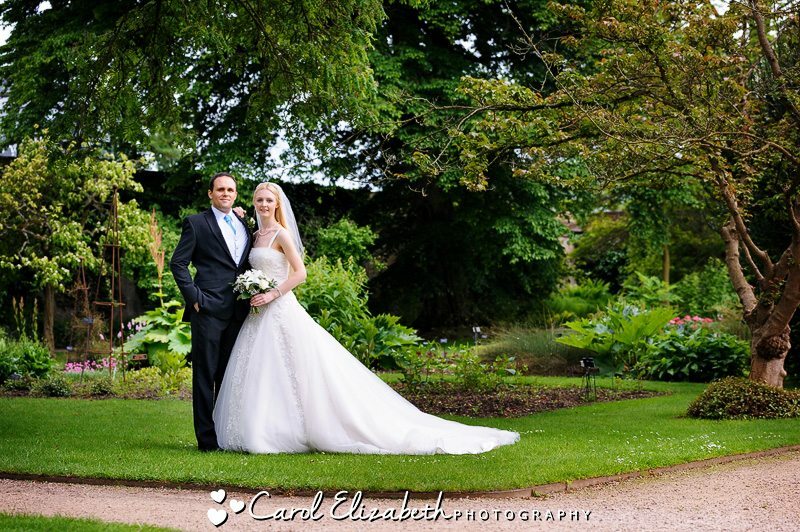 And it was such a perfect location for some portraits of the bride and groom, I’m sure you will agree they look fabulous together. 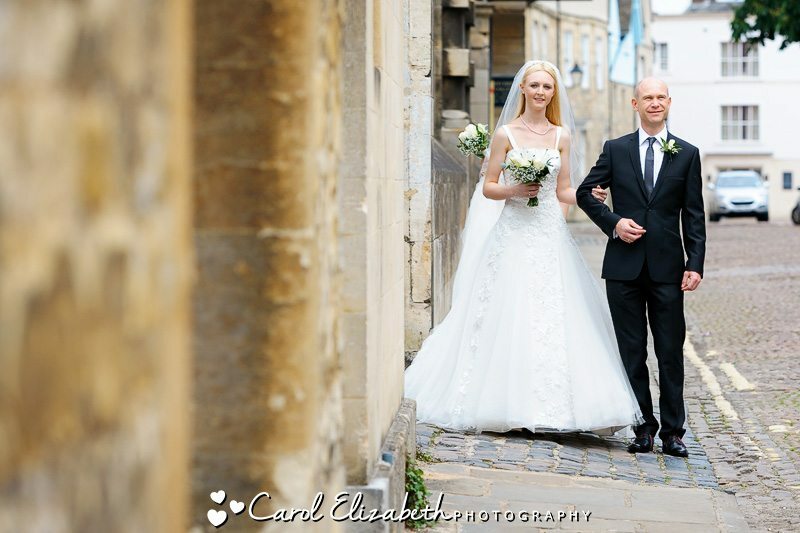 Onwards then for the wedding reception at Oxford Town Hall – we had a lovely walk post some more beautiful building around the city centre, and stopped for a few portraits along the way. 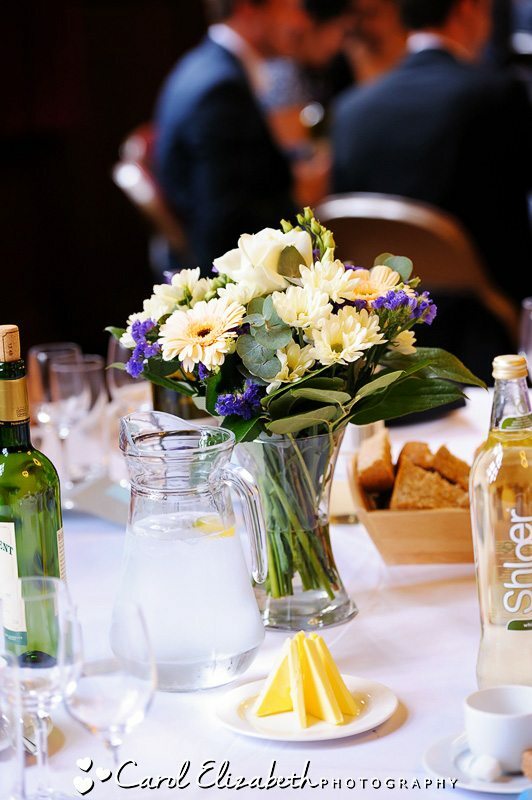 Soon it was time to sit down for the delicious meal and for the evening celebrations to begin. 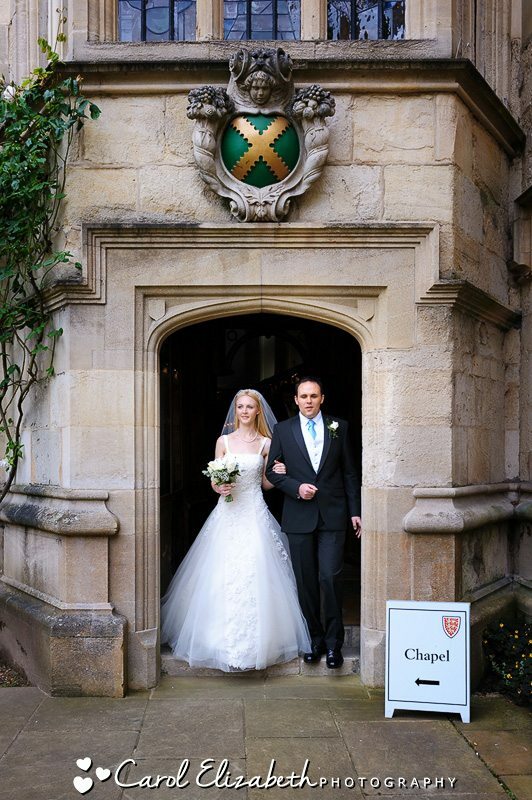 Wishing you both a fantastic future and a lifetime of happiness together as husband and wife. 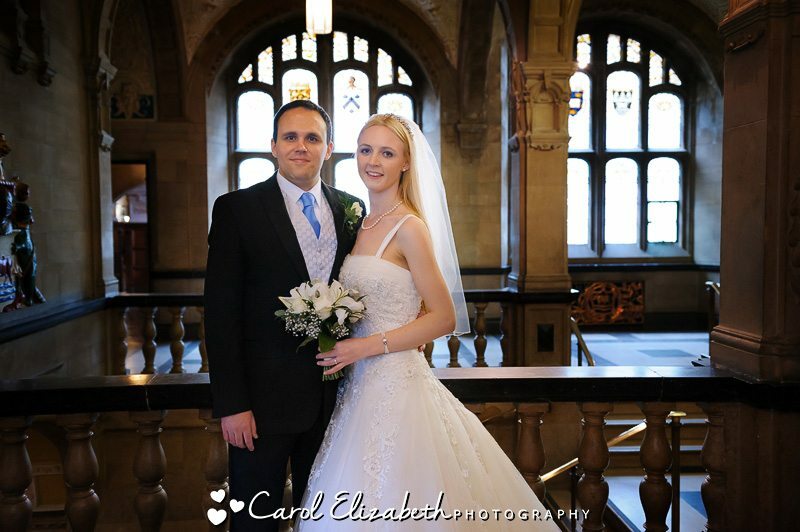 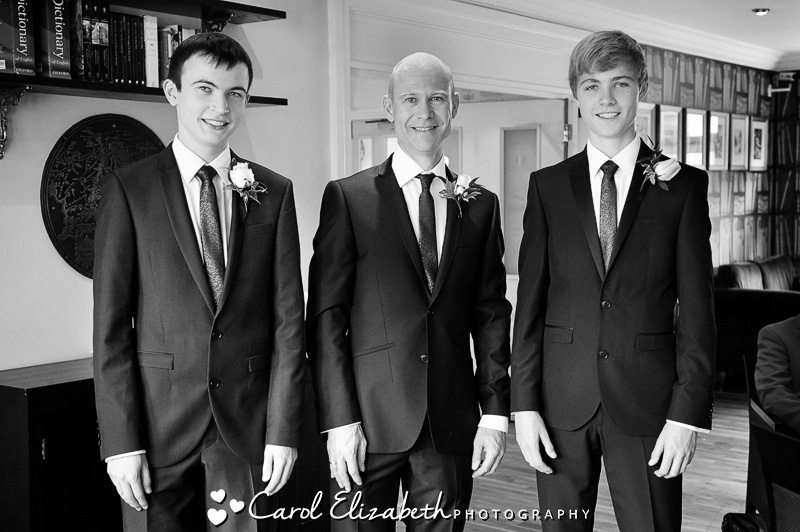 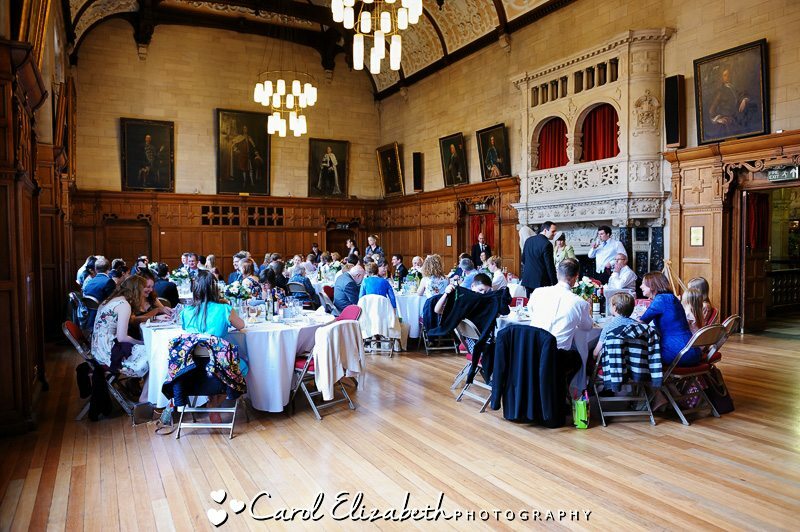 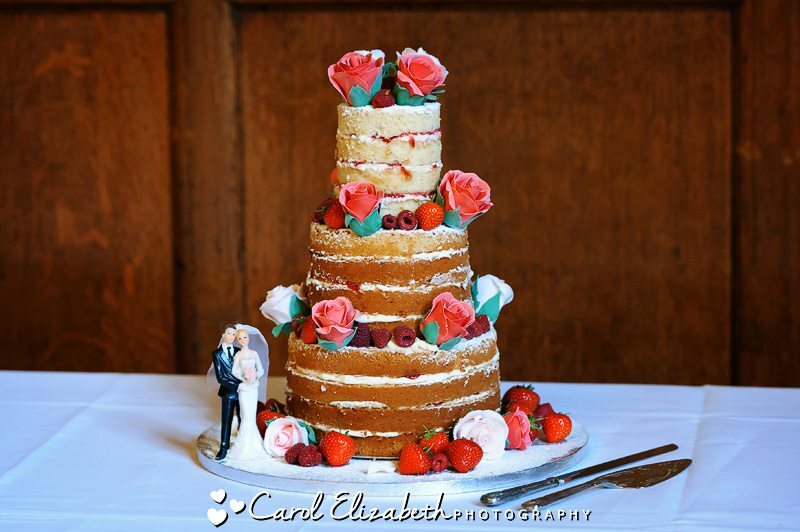 If you are having an Oxford College wedding (Oxford University wedding), or Botanical Gardens wedding reception, or if you are looking for an Oxford Town Hall wedding photographer – then please get in touch for a chat and to discuss pricing options, I would love to hear from you.